The mountains in and around Taitung are extremely beautiful. Some are low and graceful, and some majestic and bold, but all of the mountains, which are part of the Central Mountain and the coastal ranges, add a dramatic touch to this part of the island. The steep, grand peaks make an almost spiritual statement about the nature of time and life. Over millions of years of history, these mountain ranges have been formed, eroded, carved, polished, serrated and seared by the elements. 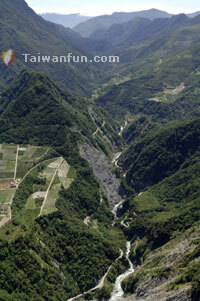 The intersecting ranges and with the coast also provide Taitung with a multitude of landscapes, with mountains, valleys, plains and shorelines. This active past has also left the area with especially interesting geological formations and a rocky terrain that is great for the eco-adventurer. Daguan Mountain Tunnel connects Taitung and Kaohsiung counties and cuts through the Central Mountain Range, connecting the eastern and western sides of the Southern Cross-Island Highway. The highway, which makes the east coast more accessible, reaches 2,722 meters at its highest point. After passing through the tunnel towards the east, the scenery opens up and, on a good day, you can see all the way to the Pacific Ocean! Don't miss the "Yakou Sunrise" or the "Sea of Clouds in Siangyang", as these are two of the most outstanding, breathtaking scenes in Taitung. Wulu Canyon, located at the last bit of ocean before the Southern Cross-Island Highway, has a reputation for being the best scenic spot on the highway. Here, the two sides of the canyon soar up against each another, making the sharp, steep hills really stand out. Another point of interest, the Tianlong Suspension Bridge, sits in a narrower part of the canyon. Although it is not that long, walking across it (and looking down!) is certainly an experience. Taiyuan Glen, inside the Coastal Range, is another place to enjoy an amazing canyon view. Surrounded by mountains, this place is the only closed basin on the east coast. Due to the area's great climate, fresh fruit and vegetables are usually abundant in the glen. Liyu Mountain, located in between Taitung County and downtown Taitung, only stands 75 meters tall but serves as a spiritual landmark in the hearts of Taitung locals. This small mountain is their mountain; if they've been traveling, they know they are home when they see it once again. On fair-weather days, people can even get a peek of Lanyu and Green islands from Liyu. Locals like to spend time hiking, strolling and climbing here, making it yet another great natural landmark in the Taitung area.